TEC4Home COPD is an evaluation of how home telemonitoring can support patients recovering at home following a COPD (Chronic Obstructive Pulmonary Disease) exacerbation. The aim is to improve patient outcomes and quality of life by reducing the number of unnecessary ED readmissions, hospitalizations and length of stay. TEC4Home COPD enables patients to receive monitoring and self-management support in the comfort of their own homes. 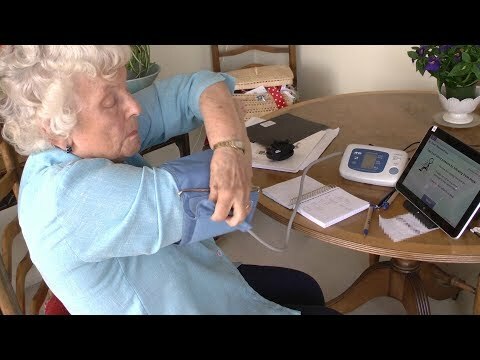 Using remote patient monitoring technology provided by TELUS Health, COPD patients enrolled in the TEC4Home project were provided with monitoring equipment, i.e. the “patient station”. The equipment includes a touchscreen tablet, blood pressure cuff, weight scale, pulse oximeter, and pedometer. Patients were asked to submit their measurements daily for 60 days, Monday to Friday. They were asked to answer questions about their other COPD signs and symptoms (shortness of breath, coughing, sputum, etc). All data was automatically sent to the TEC4Home monitoring nurse to view on the home health monitoring program. The TEC4Home COPD monitoring nurse reviewed the submitted patient data and provide one-to-one, evidence based, self-management education to the patient. Data was reviewed daily, Monday through Friday. In reviewing the patient data, if deterioration was detected, the monitoring nurse would follow up with the patient, as well as their family physician and care team for early intervention (visit to the physician, visit to the ED, etc.). TEC4Home COPD Project is now complete. From June 2017 – February 2018, patient recruitment into TEC4Home COPD occurred at Vancouver General Hospital, Richmond Hospital and St. Paul’s Hospital. Patients with COPD were approached during their emergency or hospital visit and offered the opportunity to enroll. Enrollment into the study included completing a survey and receiving a brief COPD education session and a binder of materials. Upon discharge, TELUS Health delivered and set up the monitoring equipment in the patient’s home. Patients were monitored by the nurse for 60 days, and then transitioned off the service. Researchers followed up with the patient 30 days post-monitoring to assess impact and outcomes. TEC4Home COPD, co-led by UBC Digital Emergency Medicine and Vancouver Coastal Health in partnership with TELUS Health, was a 16 month initiative funded by Canada Health Infoway and the BC Ministry of Health. TEC4Home COPD is a part of the overall TEC4Home initiative which also includes an ongoing study for patients with Heart Failure. Project Principal Investigator: Dr. Kendall Ho, Lead, UBC Digital Emergency Medicine, and Emergency Physician, VGH. The TEC4Home Healthcare Innovation Community is made up of researchers, ED physicians, family physicians, nurses, cardiologists, patients, technology partners, and healthcare administrators. For more information: Jennifer Cordeiro, Research Coordinator, UBC Digital Emergency Medicine Jennifer.c@ubc.ca. If you happen to visit a hospital participating in TEC4Home, you may be approached by a clinician or researcher to participate in TEC4Home. As with all research projects, participation is completely voluntary. If you do decide to participate, you will be randomly assigned to the intervention group or control group. Participants in the intervention group will receive the HHM technology and be asked to submit their measurements daily for 60 days. They will also be asked to fill out some surveys at different points in the study. Participants in the control group will not receive the HHM technology. The control group participants will also be asked to fill out surveys at different points in the study. This allows us to compare these 2 sets of patients in evaluating our hypothesis and allow us to determine how HHM can be used to support the transition of care from hospital to home.